Benjamin Bear is celebrating the holiday season by bringing his lady love, Bedelia Bear, twelve gifts for the first twelve days of Christmas. On the first day he brings her a beautiful little potted pear tree which has a partridge sitting in the branches. When he arrives at her house Bedelia is decorating her front door and the little creatures who live around the house are also doing a little decorating of their own. On each day we get to see another aspect of Bedelia?s life and another part of her charming house as she enjoys Benjamin?s wonderful gifts and as she prepares for Christmas. Then, on the twelfth day, Bedelia gives everyone, including kind and generous Benjamin, a glorious Christmas surprise. 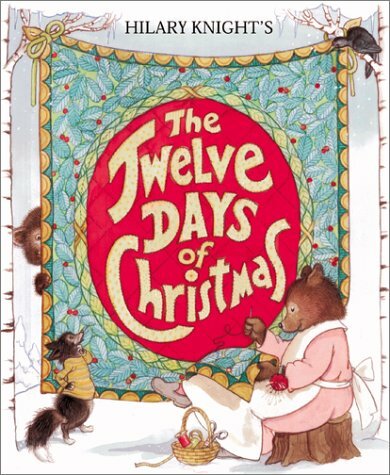 This version of "The Twelve Days of Christmas" will greatly entertain small children for there are so many things to look at on all the pages and so many little stories to follow which have been created to flow within the story of Benjamin and Bedelia. A beautifully illustrated fold out page at the end of the book is a gift in itself.